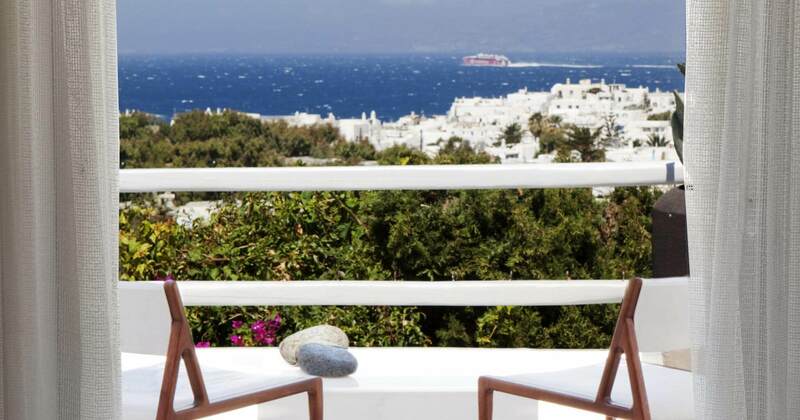 The Panoramic Suite offers an all-encompassing view of Mykonos, stretching as far as the eye can see. Turn your attention indoors, and you’ll be greeted by the Belvedere’s rendition of island interiors with a clear urban undertone, celebrating hand-sculpted wood, simple, no-frills plaster and precious monolithic marble. The Panoramic Suite comes in two different options: open-plan or divided. The Belvedere signature screen visually separates the bedroom from the living room, while two terraces offer an unobstructed view of the deep blue sea. This spacious accommodation option features an oversized bathroom (the size of a standard room) with a shower tray, a floating bathtub, monolithic sinks and a comfortable dressing area. A handcrafted mirror tops off this extravagantly luxurious suite that’s comfortable enough to become your entire world for the duration of your stay. Discretion and individual attention are the secrets to the Belvedere Hotel's continued success. All you have to do is ask.